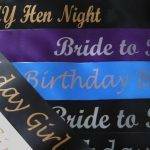 Hen Party Sashes are arguably, currently the most popular addition to any hen party. Bars, restaurants, party venues at weekend are guaranteed to see a group of girls celebrating the Bride’s last fling. They are an expensive addition to any other fancy dress that might be the order of the day. They can be colour-co-ordinated to any theme. The message can also be personalised so that it reads something like’ Natalie’s Hen Party’ rather than just a generic ‘Hen Night’ message. It’s worth going to the extra trouble of ordering a personalised sash. Because it is being printed to your individual event you can also choose whether you want to refer to the event as Hen Do, Hen Weekend, Hen Night, or Hen Party. We also print each sash individually, so if you want to change the text on each sash then that’s not a problem. 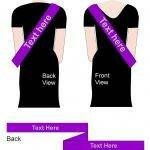 So you can have a standard message on the front of the sash. We can then put the individual names of the guests on the back of each sash. To differentiate the bride to be from the rest of the group you have a few options to achieve this. You could simply just change the wording on the Bride’s sash. It could say something like ‘It’s My Hen Night’ or ‘Bride to Be’. Or whatever wording you want. To further highlight the Bride then there is also the option to change the colour of the Bride’s sash. We always carry a large stock of different coloured ribbon which we can print in a variety of text colours. the sashes comes as a standard length, by default, but if you want one that is slightly shorter or longer, then just tell us. We can print it in the amended length ensuring that any message is still central when worn.